Although my main focus is video I'm starting to love my 50D for photography. 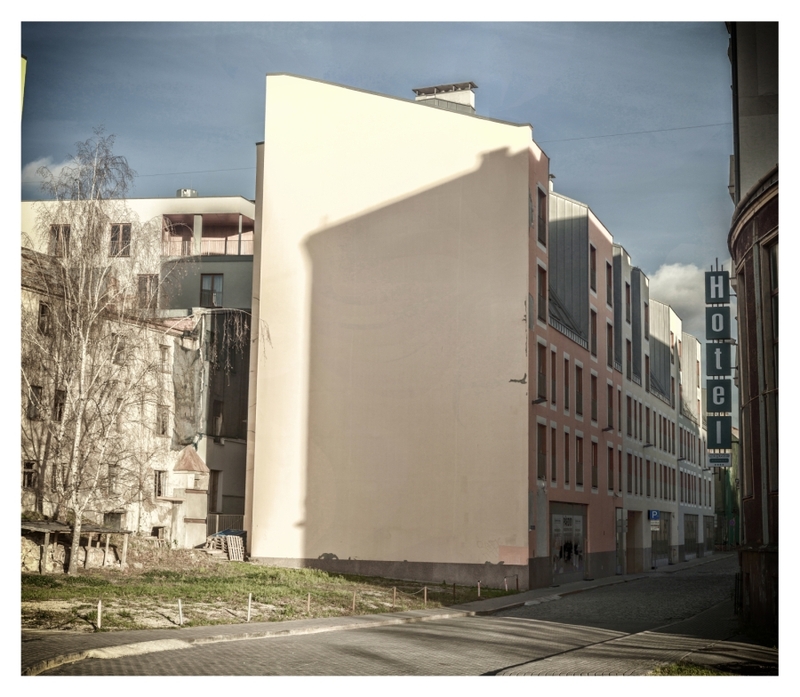 I've been experimenting with photo matrixing, taking multiple shots of interesting architecture around Riga, Latvia. Thank you for the link and the app. Your pic looks nice. Also, please read my signature. What a wonderful image. Love the tone and old feel to it. Very nice. I'm intrigued to look into this technique!! May I ask what aperture this was taken at? My Gear: EOS 550D | Sigma 10-20mm f5.6 | Sigma 17-70mm f/2.8-4 DC OS HSM | Sigma 70-300mm f4-5.6 | Canon 50mm f1.8 | Canon 18-55mm f3.5-5.6 | Cokin Z Pro Filters | Giottos Carbon Fibre Tripod. I was using a manual lens but I think it was around F8. Thanks. Yes, that can be a problem with this method. Some shots took me a few mins to complete and people/cars move. I've spent the last few hours photoshopping out disembodied legs and ghost cars. The stitching app is great but not perfect. Really nice images. I think the subtle HDR look strengthen the autumn mood of the pictures. It's a software the gives the user much control over the stitching process, f. e. it's possible to mask out objects. It takes a while to get into the possibilites of the programm, but it's really worth it. More great captures. Does the dual iso function work with the 550D? It seems like a fantastic feature. I thought the 7D and MKIII were the only two cameras to work with it?? If it works on the 50D I guess it can work on the 550D. It's a module so you could try loading it and see what happens. I've only ever been into the video side of things but since ML raw video capability came along I find myself shooting less quantity and more quality. This means I'm out shooting far less video unless I have a specific piece in mind (bored to death with tests TBH). I still wanted to use the camera so I tried Dual ISO and I was instantly hooked. I'm gonna spend a lot more time learning photography I think and it can only help improve my raw video work. Indeed ML have been a school for me, a place... can i say a home?? With raw video i just learn to shoot what i want/need, been more careful about what i shoot. Learning photography will make u a lot better in video for sure. It sounds like you're looking at unprocessed CR2 files. They need to be processed into DNG format with the cr2hdr command line utility. I used a1ex's cr2hdr-amaze-edge2.exe for the shots in this thread. There is a download link for the .exe in the Dual ISO thread but you'll need to search the forum for it. I have to ask andy... can you share you're colour workflow? love the look!! There's nothing much to the basic look TBH other than using the VisionLog DCP to flatten the images then extreme use of the highlight (sometimes -100), shadows (+50 - +60) and clarity (+50 - +70) sliders in ACR. I wanted a fairly muted, low contrast look with a bit of punch (I know, that sounds contradictory lol). I tend to increase vibrance (+20 - +50) and reduce saturation (-10 - -30) which makes certain colors pop and then increase contrast (using the contrast slider) until the darks feel roughly in the place I want. I then use the curves to increase/decrease the mids and highs depending on what is needed (i.e. to recover more highlight info or increase mid contrast). I didn't use much sharpening as there can be an insane amount of detail when you stitch 50+ 5k shots and Dual ISO means I rarely need to use any noise reduction. Lastly, I manually adjust WB to either warm or cool the look and use the tint slider if it needs subtle correction. Once I have a look that I'm happy with I apply it to the other shots that will make up the panorama and export to 16bit TIFFs. I then load them into ICE and let it do it's stitching thing. Hit auto crop and export the stitched file as a TIFF (can be a huge file). I then load this into Photoshop, do a little dodge/burn where I think it needs it (i.e. make the foreground more contrasty), play with cropping (although I'm a bit lazy and could probably compose better), add a vignette and a frame using a NIK plugin and save again as a TIFF and a lower res Jpeg. I did use some NIK color contrast on a couple of these shots and use the plugins a lot for other work but these were pretty much all ACR and Photoshop. I wasn't too careful when shooting a couple of the panos and missed snapping some foreground detail (road,cobble paths etc) but I just filled the missing sections with the clone stamp tool. The images could be much better TBH but I was just experimenting. I feel quite comfortable with the workflow now so I'm gonna try to shoot some 'for print' panos, night cityscapes etc and spend much longer on post production. If there is anything specific you want to know just ask. I can upload a few of the ACR presets I created but obviously each shot is different and thy probably wouldn't be of any use. Thank you again, been looking how to get this look for so long now! A ACR preset would be nice indeed and i can play from there! These are great Andy. I've done plenty of landscape stuff, but never thought of doing it in the style you have. It is really a good example of why all the megapixels, dr, latitude, dual iso and such don't matter much. Despite all that, those are still horribly composed, randomly framed terrible shots. It seems that it does not even matter if the camera is leveled in those mega-multi-milion-pixels "architecture" shots. No ML feature or other hack will ever help fundamentally bad pictures. Hush up Broughtonfilm, you're horizon isn't straight! In the first two sentences of the thread, he states that these pictures are experimental and he's mainly a video guy. But then again, no amount of descriptions and information will ever help fundamentally bad reading comprehension skills. Want to help with the latest development but don't know how to compile? Had a chuckle while reading that especially after writing this: "although I'm a bit lazy and could probably compose better"
Give me some composition tips if you want. I'm not precious. I am really glad you have a good sense of humor and distance to your photos. Nothing that I wrote is against you personally and expresses a general thought about photography, using your photos only as an example. If pictures are bad, it does not matter if they are at the top of one's abilities, involve advanced techniques, technologies, are a result of an experiment or laziness - they are equally bad at the end of the day and as such a perfect example that proves my point, which was all I did. Anyone can love your photos if they want, I hope that saying they are terrible is also ok, it is a great thing that we can disagree. using your photos only as an example. If pictures are bad, it does not matter if they are at the top of one's abilities, involve advanced techniques, technologies, are a result of an experiment or laziness - they are equally bad at the end of the day and as such a perfect example that proves my point, which was all I did. When that opinion (or more specifically, your point), is provided with no supporting contribution on how the photographer may learn to produce "good" photos in the future, specifically when said photographer advised he would be happy for some tips to improve his composition, what you consider poor, then your posts can only be constructed as trolling. No more, no less. I would suggest that your next post in this thread contain helpful information. Opinions are like assholes, everyone has one! Balance shot 2 and 3 more, other than that its fine and dude is just a hater. People rag on me too to take elements out instead of taking the presence of a place. ICE has a few different options for stitching also (camera motion). Best results will be obtained where movement of the camera is consistent. This is quite a challenge hand held! You could use ShiftN to correct the converging lines. I saw one of Stockmann. Was in Helsinki a couple of weeks ago. Here is one of my own of Stockmann (I remember correctly - this was a Dual_ISO pic). Canon 5D Mark III, Gopro Hero Blacks with 3D Casing, A Few Lenses, Adobe CC 2014, MacBook Pro, Windows 8 PC, Lots of Video Rig! how much dynamic range do you think you get using dualiso ml without taking more then one shot? also, is it possible to do dualiso in raw video mode on the 50d? is it possible to stich photos if you have a human on the far left or far right of a horizontal photo?